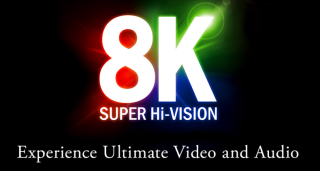 8K TV: Japan aims for 8K broadcasts in 2020 | What Hi-Fi? Nippon Hoso Kyokai (NHK) – also known as the Japan Broadcasting Corporation – has confirmed its plans to broadcast the Japan 2020 Olympics in 8K (Super Hi-Vision). Never one to rest on its technological laurels, NHK aims to "provide broadcasting and services of the world's highest standards, utilising leading edge technologies". And that means 8K TV, with 2020 the target year and timed to coincide with the Tokyo Olympic and Paralympic games. NHK confirmed its 8K project - first mooted last year - had been approved by its board of governors as part of the company's corporate plan for 2015-17. 8K resolution, 7,680 x 4,320, delivers 33,000,000 pixels, 16 times that of HD. NHK is also planning a 22.2-channel 3D sound system to accompany its "Super Hi-Vision" plans. Panasonic and NHK revealed a 145in 8K plasma display back in 2012, though we fear there won't be too many plasma panels around when NHK comes to test its wider 8K broadcasts, which are scheduled to start in 2016. Next month, NHK will be holding an 8K "public viewing" in Tokyo of footage shot at the Sochi Winter Olympics using an "experimental live relay utilising [a] wireless 8K transmission device". Realistically, the rest of us are more interested in 4K for now. Sky trialled a 4K broadcast back in 2013, while the BBC and Sony also demoed 4K at Wimbledon last year. There were also a few public 4K broadcasts of the World Cup. More concrete plans from the BBC, BT Sport or Sky are yet to materialise.